Imagine Captain America with a turban and beard. That’s one idea that has been brought to life by a Vishavjit Singh, a Sikh American cartoonist. 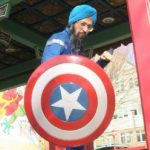 This four-part series highlights a recent conversation with KBCS’s Yuko Kodama and Singh about what inspired his idea for Sikh Captain America and how this character is making an impact. “Wham! Bam ! Pow!” is the name of the exhibit featuring drawings of his superhero identity fighting hate and intolerance. The exhibit is at the Wing Luke Museum of the Asian Pacific American Experience. Part 1: Singh shares how he came to put on his Sikh Captain America suit for the first time. Part 2: Singh describes how children respond to his turbaned and bearded superhero personality at story time. Part 3: We hear more from Singh as he recounts an experience he had while working on a video. Part 4: Singh talks about how he responds to harassment and confrontations.